One of the reasons why the Supernatural fandom is like no other is the intensity of fan engagement. When the audience suffers the loss of one of these beloved series characters the impact is felt deeply. But the death of three series regulars—­Rowena, Crowley, and Castiel­—was a shot heard round the Supernatural world. With the deaths of the Winchesters’ most powerful and accessible allies, and Mary Winchester being trapped in the alternative universe, the decks are cleared for Season 13. Though it’s likely that one or more of these characters will return, one way or another, it creates a new dynamic for the Winchesters as they cope with the newly born, and super creepy, Nephilim. An off-screen death for such a significant character was surprising, though seeing Lucifer holding a lock of Rowena’s gorgeous red hair did make us gasp in horror. It seems the choice to kill Rowena off-screen wasn’t simply for dramatic effect, but because there was so much more death to come. We loved the scene with Lucifer because it reminded us just how dangerous the Devil is unrestrained, but did Rowena instead deserve a scene showing her fight to the end? Probably. At the same time, we’re not sure we wanted to watch this impressively powerful witch in her final defeat. Her off-screen death only increases our belief (desire? desperate hope? delusion?) that Rowena will return to Supernatural in some capacity. After all, Ruth Connell is the actress with the most frequent appearances on the series, and one of our favs. Rowena brought something new to the series, starting with her mysterious Scotch-drinking appearance at the end of “Soul Survivor.” Not only was she a powerful witch whom the Winchesters were never truly able to defeat, she created some fascinating family dynamics. From the moment she was revealed to be Crowley’s Mum in “Girls, Girls, Girls” to her last cruel revenge on her son in “Family Feud,” the relationship between Rowena and Crowley was unique. We’ll always love Rowena because she’s a powerful, clever, and layered villain played with a great deal of humor and grace by Ruth Connell. Crowley arrives at the bunker, because “whenever there’s a world-ending crisis at hand, I know where to place my bets. It’s on you. You big beautiful lumbering piles of flannel.” When Crowley learns of his mother’s death he notes sardonically, “Funny, I always thought I’d be the one to kill her.” No one delivers a line with the wit and skill of Mark Sheppard. He takes dialogue that could otherwise feel like a punchline and gives it gravitas. Crowley has come to the Winchesters to propose that they put Lucifer back in the Cage, at which point Crowley would seal the gates of Hell. We’re a little fuzzy on the specifics of the plan to get Lucifer back in the Cage, besides hoping Crowley learned a lot of powerful magic from working alongside his mum. But it turns that the impending arrival of the Nephilim has created a tear in space and time, providing an opportunity for Crowley to improvise with some spellwork. It turns out that Crowley’s spell needed a last important ingredient—a life. Just when you think Crowley is going to use some other poor sucker—maybe Dean—to complete his spell, the King of Hell makes the ultimate sacrifice. Even when Crowley loses, he wins. When Crowley put the knife in his own chest, you were shocked, weren’t you? This selfless act is a respectable end for such a highly regarded character. Crowley has rationalized helping the Winchesters as maintaining a valuable ally, but it’s also possible he’s still a little soft since his infusion of human blood. Crowley’s realization that he hated being the King of Hell is believable; getting all the way to him giving up his life to defeat Lucifer is a bit more of a stretch. Mark Sheppard reports that his line, “Even when I lose, I win,” was cut from his final scene, which would’ve provided a bit more explanation for his actions. Instead, Crowley’s last words were, “Bye, boys,” making his final moments not just about revenge, but about his connection to the Winchesters. Of all the characters we lost in “All Along the Watchtower,” Crowley’s death feels the most likely to stick, and not just because Mark Sheppard has been insisting on Twitter and Armageddon Expo that he’s not coming back. If he were to return it would lessen the significance of Crowley’s act. It’s hard to imagine Supernatural without Crowley, but the boys will have to learn to get along without him. Castiel rented a cabin, took an online doula course, and bought a truckload of diapers to prepare for Kelly giving birth to the Nephilim. You can’t be too prepared for the son of Satan. Kelly plans on naming him Jack, which sounds way less creepy than “The Nephilim.” Knowing that the birth will kill her, she records a message to her son. Kelly tells Jack that she knows he’ll be okay because he’ll have an angel watching over him, hearkening back to Mary Winchester telling Dean as a child that angels were watching over him. Misha Collins has given us different versions of Castiel over the years, but in “All Along the Watchtower,” Castiel is in classic form. As he protects Kelly and prepares for the arrival of her baby we get the Cas we love the most—often awkward, sometimes sweet, but always brave. When he sees a strange glowing light in the backyard, Cas doesn’t hesitate to investigate. He finds a parallel universe in which John Winchester and Mary Campbell never married, Sam was never born, and the Apocalypse ensued. It isn’t until we see Bobby Singer that we realize we haven’t seen Jim Beaver all season. Beaver is the only actor besides Jared Padalecki and Jensen Ackles to have appeared in every season of Supernatural. Bringing an alternative-universe Bobby, who seems remarkably like the Bobby Singer we know and love, to the finale was a great move. Bobby’s hobby and passion is killing angels, but he sees there’s something different about Castiel and spares him. When Castiel returns to the regular world he seems a little off. We keep thinking we’re going to learn he’s not really Castiel, but then he seems to know what’s up with Kelly so we shrug it off. But then the Winchesters arrive and Castiel heals Dean. Did we imagine it, or did Dean seem kinda surprised? Like Castiel’s healing powers were extra minty or something? If there was one thing we learned from Casifer, it was that Misha Collins is an amazing actor, so we’d imagine whatever acting choices he’s making, it’s intentional. We don’t get much time to think about it, because “All Along the Watchtower” springs into high gear with the arrival of Lucifer. A lot happens after Lucifer shows up. The Winchesters lure him into the parallel world, Dean uses Bobby’s gun, “Rufus,” to keep Lucifer distracted (“Say hello to my little friend!”), Crowley casts a spell and sacrifices himself to start closing the tear, and Castiel storms in to finish the job. It’s not clear if Crowley’s plan always involved Castiel facing off with Lucifer in the upside-down world, but Castiel has murder in his eyes as he charges towards Lucifer. Within a minute of losing Crowley, we see Castiel killed by Lucifer. We barely have time to absorb what just happened and it’s not over yet. Dean is immobilized by Castiel’s death and we feel his shock. It’s a good death—well played and dramatic. There are a number ways for Castiel to return (Nephilim Jack could bring him back, Chuck could resurrect him once more, or something involving a parallel universe Cas). Despite this, we were left mouths agape at Castiel’s death. Admit it, you shouted at your TV too. Then later, there was the crying. One hundred episodes are just not enough when it comes to Misha Collins. Mary fulfills her desire to punch the Devil in the face. Despite Crowley’s sacrifice and Castiel’s attack, Lucifer emerges and tells the Winchesters that playtime is over. But Lucifer doesn’t expect Mary Winchester, who punches him back through the tear wearing the Men of Letters brass knuckles. Suddenly we love Mary Winchester again. Mary may be trapped with Lucifer, but we feel confident she’ll survive, either because Lucifer will decide to keep her alive, or because she’ll be rescued by someone in the parallel world, or some combination of both. 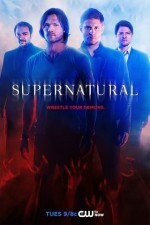 Scheduling “Who We Are” alongside “All Along the Watchtower” certainly created some finale drama for Season 12 of Supernatural. It also gave us a feel-good win episode in “Who We Are” to help us deal with so many losses in “All Along the Watchtower.” It also serves to bookend Mary’s story. Dean shares his justifiable anger with his mother for making the deal with Azazel in “Who We Are.” Then in “All Along the Watchtower” we learn what would have happened if she hadn’t made the deal and Sam and Dean hadn’t been born. And it’s pretty bad. It doesn’t mean that Dean isn’t entitled to his resentment after everything that he and his brother have been through, but it gives us a more complete picture of the story. Supernatural has always been about freewill and the Winchesters choosing each other, but it’s also been about making sacrifices to help others. An alternative universe devastated by the Apocalypse is a confirmation of the theme we’ve heard several times this season—the Winchesters are the guys who save the world. As Dean stands outside paralyzed after losing Castiel and his mother, Sam goes into the cabin to find Kelly dead. He walks into the nursery to find a yellow-eyed nephilim sitting next to the crib, which feels like a callback to the pilot when Mary walks into Sam’s nursery to find the yellow-eyed demon. When the nephilim looks up at Sam, we realize that the name Jack isn’t going to make this creature any less creepy. The scene is horror movie-good. The alternative universe has always been one of our favorite science fiction tropes. Though Supernatural has used this storytelling approach several times, a whole world where the Apocalypse actually happened is rife with opportunity. We’re thrilled at the potential created by a world inhabited by favorite characters such as Bobby Singer and possibly others who could return to the series (Gabriel? Charlie? Meg? Cain? Kevin? Zachariah? Ruby!?!). The only way we can foresee being disappointed by this storyline in Season 13 is if we don’t get the return of at least one more character that we either love or love to hate. Or how about a good witch version of Rowena or an evil Castiel? And will Lucifer meet his counterpart? The possibilities are endless. Speaking of Lucifer, we can’t say enough about Mark Pellegrino’s acting. Lucifer was the terrifying but mocking devil we feared in Season 5. His backslide into evil shows us that even though Chuck may not have created Lucifer as a villain, he’s become irredeemable. Misha Collins and Mark Sheppard were also riveting to watch, all contributing to making this a standout episode. One aspect of Jensen Ackles and Jared Padalecki’s acting repertoire that is always a surprise, even though we’ve seen it before, is how they let others shine. Both Ackles and Padalecki have the ability to do their own parts flawlessly while keeping the focus of the episode on the other actors when it’s appropriate for the story. Certainly, Director Robert Singer deserves credit, but Ackles and Padalecki played their parts in a way that reinforced that Collins, Sheppard, and Pellegrino were the stars of this episode. A lot happened in “All Along the Watchtower,” making it one of the most memorable season finales in a while. It was an exciting and suspenseful way to end Season 12, and we don’t even mind that it’s a cliffhanger. We can’t wait to see what Supernatural has in store for us for Season 13.